It curls like a big curly thing at the sides, so I weighed it down with anything that was to hand. I'm using Patons Pure Wool Crepe DK which came from my Granny. This is what was left over from my Levenwick Cardigan. It's more red in real life. I absolutely love the cable on the back. It is, without doubt, the most gorgeous cable I have ever seen. And I don't mean that in an "admire my knitting skills" way, I mean it in an "Ysolda is a pattern-designing genius" way. 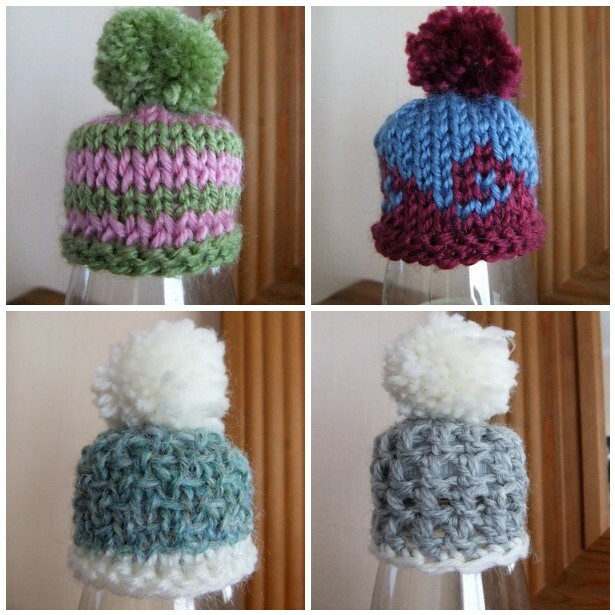 And here are my next four Smoothie Hats. Your sweater looks fabulous! I agree about the cabling too. I'm a fan of cabling and keep meaning to learn how to do it without a cable needle. One of these days........!! Thank you! I feel sewing inspired with your blog, sadly I'm not that good at it!